The reason there was a Boss 302 back then is racing. And the reason (but surely not the only reason) there's a new Boss 302 today is racing. This time, however, Ford isn't playing catch-up. In order to compete effectively in the SCCA's Trans Am road racing series, in 1967 Chevrolet had created the Camaro Z/28 and its high-revving, short-stroke "DZ302" 302-cubic-inch (5.0-liter) small-block V8. In the hands of team owner Roger Penske and under the whip of driver Mark Donohue, the Z/28 won three of the 12 Trans Am races run during 1967. Then during 1968, in one of the most dominant professional road racing performances ever, Penske and Donohue won an incredible 10 of the 13 races, including an unfathomable eight in a row. The Boss 302 was engineered specifically as a response to the ludicrously successful Z/28 and as a way of rearming Ford teams competing in Trans Am. And the essential element of the Boss 302 car was the Boss 302 V8 engine. Combining a fortified "Windsor" block with the relatively free-breathing cylinder heads from the then-new "Cleveland" 351-cubic-inch V8 was the major trick of the Boss 302. Throw in some solid lifters for precise (and loud) activation of the oversize valves, a sewer pipe-size four-barrel carburetor and the result was a 302-cubic-inch engine underrated at 290 hp while screaming at 5,800 rpm. That engine would help make the Mustang Boss 302 competitive in the Trans Am series during 1969 and earn it a championship in 1970. 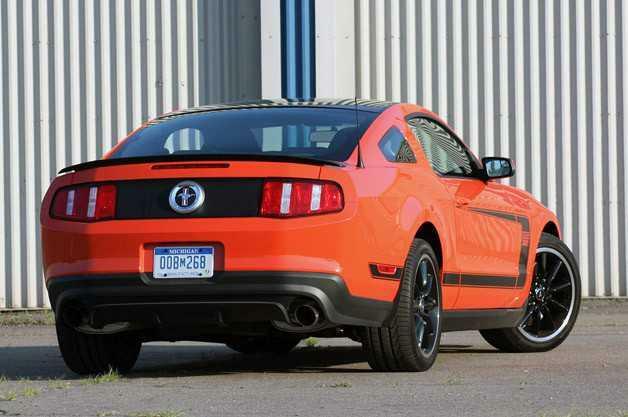 Conceptually, Ford's 2012 version of the Boss 302 V8 follows a similar developmental path. Starting with the new "Coyote" DOHC 5.0-liter V8, the engineering team concentrated on improving its talents for use in the Boss 302R road race Mustang. The Boss 302 engine is more powerful, but it's not a radical revision of the Mustang GT's V8. As with the old Boss 302 the decision was made to concentrate on high-rpm power production by optimizing engine respiration. To that end a new set of cylinder heads was developed with CNC-machined ports that allow better breathing at high rpm. More aggressive camshafts were also fitted to take advantage of the increased air flow. The valvetrain components were lightened to better survive those higher engine speeds and new sodium-filled exhaust valves dissipate heat more effectively. New forged aluminum pistons and sinter-forged steel connecting rods were also added to solidify this 302's bottom end. All that's inside the engine. The more obvious change from the outside is the adoption of a new short-runner composite intake manifold sitting in the valley between the cylinder heads. "The effect of the new intake design is dramatic," said Mike Harrison, Ford V8 program manager in a release. "When I took the prototype car to Mustang chief engineer Dave Pericak, he took a short drive, tossed me the keys and said 'Book it...it's in the program.' He knew what we were onto, and that's really the point where the Boss 302 was born." The new 2012 Ford Mustang Boss 302 engine packs a 150-hp (rated) greater wallop than the old Boss 302, but Harrison asserts, in character they're similar beasts. "The first Boss 302 was a specially built, free-breathing, high-revving small-block V8 that gave it certain characteristics on a race course — and we capture that essence in the new engine," he said. "In keeping with the spirit of the original, the new Boss 302 achieves its maximum power output at speeds at or above 7,500 rpm. Unlike the original engine, however, low-speed torque and drivability are uncompromised thanks to twin independent variable camshaft timing (Ti-VCT) technology and computer-aided engineering design tools." In fact, the biggest difference between the Mustang GT engine and the Boss 302's is an increase in the red line from 7,000 to 7,500 rpm. Despite all those modifications, what's most interesting is what doesn't change. Compared to the Mustang GT's standard version of the 5.0-liter V8, the Boss 302's compression ratio is apparently unchanged at 11.0:1 (and still "estimated" according to Ford). Valve diameters stay at 37mm on the intake side and 32mm on the exhaust, and valve lift specs remain at 12mm intake and 11mm exhaust. The Boss 302 engine is more powerful, but it's not a radical revision of the Mustang GT version of the same engine. Ford isn't even claiming a change from the manual-transmission-equipped Mustang GT's 17 mpg in the city/26 mpg on the highway EPA mileage ratings despite the Boss 302's standard 3.73:1 final-drive ratio. 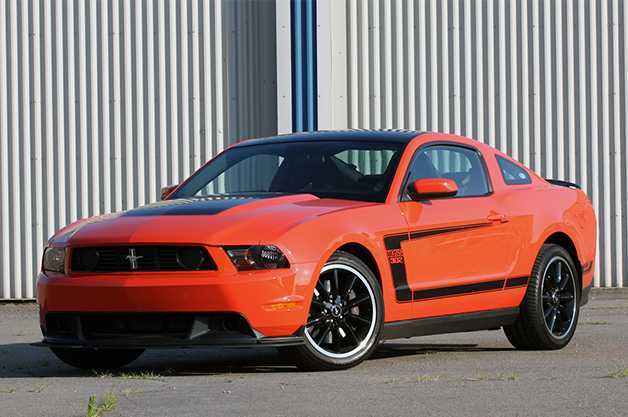 But the 2012 Ford Mustang Boss 302 won't be for everyone. For instance, while the Mustang GT's engine is rated at 390 pound-feet of peak torque at 4,250 rpm, the Boss 302 V8 loses 10 lb-ft somewhere along the line — peaking at 380 lb-ft. While the GT can get by on 86-octane swill, the Boss 302 demands 91-octane fuel or better. And the Mustang GT is available with an automatic transmission. The Boss 302 is manual only. Back in 1969 and 1970 the Boss 302 came with a stiffer suspension, reinforced shock towers, larger front and rear anti-sway bars and standard front disc brakes. Those were all significant improvements back when high tech in a car still meant a "transistorized ignition." The changes to the new Boss 302 are more extensive. 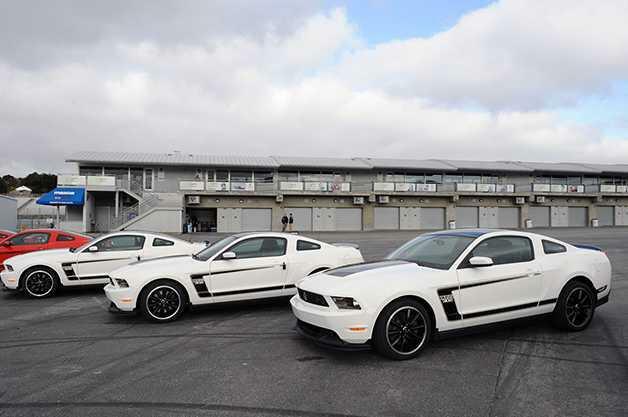 Aesthetically the new 2012 Ford Mustang Boss 302 grabs a few cues from the original, but it isn't a clone. Yeah, there's the C-stripe along the car's flanks. And the "Boss 302" lettering is familiar. But the standard rear spoiler doesn't stand above the deck lid on posts and the vertical rear window slats that destroyed rearward vision in the first car are missing from this one. Also, the front spoiler is a splitter this time instead of a deep scoop, and the flat black hood has given way to a flat black center section on the hood and flat black on the roof (variations will also be available). About the sweetest twist in the looks is the blocked-off holes for the GT's driving lights. It looks tough and racelike, even if it is a theatrical embellishment. Naturally, all Boss 302s get a heavily revised suspension. The stiffer springs result in a slightly lower ride height (11mm in front, 1mm in back) while firmer bushings and a thicker rear sway bar further stiffen the ride. Five-way-adjustable dampers are also part of the package, along with an adjustable electric steering box. The tires are summer-spec 255/40ZR19 front and 285/35ZR19 rear Pirelli P Zeros on special alloy wheels. The Brembo front disc brakes have four-piston calipers clamping down on a 14-inch disc, and the rear disc pads have a special compound. The ratios in the Getrag gearbox are shared with the GT, with 5th a direct drive and 6th an overdrive. Oddly, the Boss is 26 pounds heavier than a standard GT, according to Ford's stated 3,631-pound curb weight. Inside the cockpit there's some specific trim and Recaro seats are available, but otherwise it's a Mustang in there. And that's no bad thing.